5 pairs of soft reusable breast pads. Available in 11cm or 13cm diameter, in undyed(natural) or black bamboo fleece. Please choose which size you would like from the drop down menu. 5 pairs of LittleLamb bamboo breast pads with a mini wash bag. Available in 11cm or 13cm diameter, in undyed(natural) or black bamboo fleece. These reusable breast pads are slim and therefore discrete when tucked inside your bra. They are soft and absorbent. Each pad consists of a double layer of 100% bamboo fleece with a waterproof layer PUL for extra protection. The 11cm diameter pad is suitable for most nursing mothers but the larger size holds more. Please prewash pads before use. You will need between 5-10 pairs depending on your milk let down and your washing frequency. As a fabric item we do advise that the breast is wiped over before feeding, to ensure there are no stray fibres. 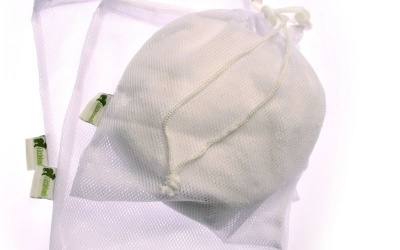 These washable breast pads now come in a 22cm x 25cm mesh laundry bag. Place all used pads in the bag and place in the washer and you wont lose any. Being woven and not knitted they may shrink up to 5% and lose a bit of shape but that's the nature of woven bamboo - but they work brilliantly. I purchased these for our daughter a few months ago before she had her daughter. She struggles to combine environmental products and a family, so I thought I’d help out. Two weeks ago she asked where I got these pads from because they were such good quality and so soft, much better than her other ones. They must wash well too. She now has two sets. 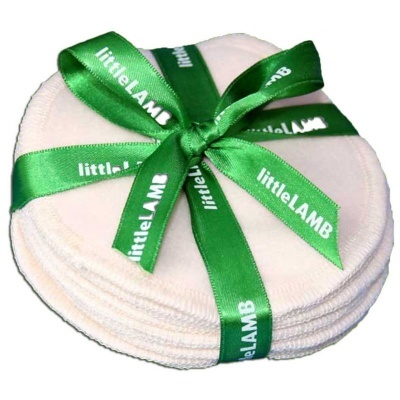 I would happily buy these again and recommended them to anyone looking for washable breast pads.